For many people Christmas begins when they listen to the broadcast of service of Nine Lessons and Carols and the lone boy chorister sings the first verse of Once in Royal David’s City. Nothing beats a live performance and I was pleased to be at Holy Trinity in Southport for their carol service which blended the traditional, including a choirboy singing the famous solo, with the new and unfamiliar all performed to a very high standard. There was more excellent music in Ince Blundell at the Amadeus Chamber Choir’s carol concert. One group of people we must not forget are those who are homeless or who have fallen on hard times. Once again this year a shelter will be open over the Christmas period and it is heartening how many people have volunteered to give up part of their Christmas to spread some seasonal joy. I shall be visiting the shelter on Christmas Day. Another group of volunteers who will be working over Christmas are the Samaritans. Around eighty people give their time to provide this important service. 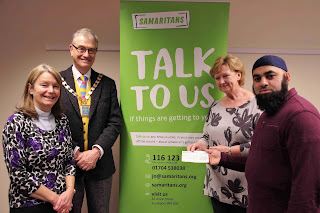 Thanks to an initiative by Soyful Alam, the Iman of the Southport Mosque, and Rod Garner from Holy Trinity £400 was raised for this local charity. I was delighted to be there when the cheque was handed over to Christina Morgan the Director of the charity. I would like to thank all the people sent in toys for the Mayor’s Christmas Toy Appeal. Because of their generosity over 400 children will get a Christmas present. A special mention to ASDA in Southport who supported the appeal by acting as a collection point and to local business Paymentshield who collected gifts from their staff. I would like to report on a couple of events involving young people. The 11th Sefton East group of Scouts invited me along to be interviewed as part of one of their badges. We had a great evening and they asked lots of challenging and interesting questions. I also attended ceremony at Chesterfield High School to mark the end of a course undertaken by some students and delivered by the UK Military School Academy -a group of former professional soldiers. It was clear talking to the students this had been a great success.